You've heard it before: Paint can entirely transform a space. When you're considering the look of your kitchen, the color of your cabinets is a huge part of how the space is going to look and make you feel. Because they take up a large area of visual space, it's important that the cabinets are a color that works well with the rest of the decor. Most importantly, however, your kitchen cabinets should be a color you love. Read on for tips on choosing the best colors for your kitchen cabinets. You can often make the decision easy on yourself by using your cabinet's design style as your guide. If you have a traditional kitchen, classic colors like creams and whites will almost always look beautiful. Likewise, Shaker and Arts and Crafts styles will work well with bright whites and subdued creams. 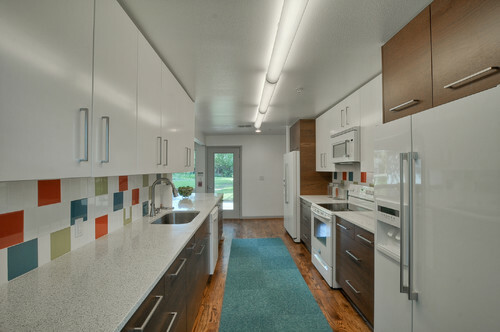 If you have a modern kitchen, your palette can expand significantly, as contrasting tones and bright colors work very well with modern design. Love red, green, or yellow? They can often work in a modern kitchen. Do you have a big kitchen or small kitchen? Is it well lit? These questions are important because the color of your cabinets can either enhance or oppress in your kitchen. A small or under-lit kitchen will benefit from lighter kitchen cabinets, while dark cabinets will work fine in a bigger, well-lit space. Sometimes, it's impossible to know how long you'll live in your home. But if there's any chance you could be selling your home in the near future, stick with neutral colors so your home will appeal to a wider audience. Using contrast to your advantage can work well when you're choosing a kitchen cabinet color. The contrast created when black cabinets are paired with light kitchen design is beautiful. 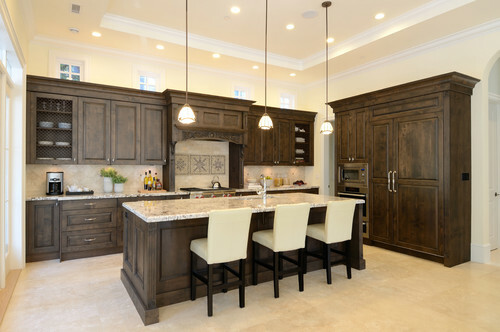 Gray or dark brown kitchen cabinets also look stunning when contrasted with light kitchen design. Feeling bold or playful? Two kitchen cabinet colors can be fun and impactful. If you want to play it safe, choose just one bold color and pair it with a neutral cabinet color. This also works well when you use a bold color sparingly. Try painting just your kitchen island cabinetry a different color from the rest of the kitchen for a fun, but not overpowering, punch of color. Some people shudder to think of painting over the beauty of the wood on their kitchen cabinets. If you'd like to preserve that beauty, but still want some color in your kitchen, consider staining the wood with a color you love. If you choose to paint your kitchen cabinets, a distressed finish is often a good style to choose, as it relieves you of some of the maintenance that comes with painted surfaces. If neutral colors are too boring for you, but bold colors are too much, find a compromise in using two shades of one color. Use dark shades of a gray or tan on your upper cabinets while light shades of the same color are used on the lower cabinets (or vice versa). This technique keeps things neutral but adds an extra element of visual interest. Whether you're painting existing cabinets or choosing completely new ones, make sure you choose high-quality construction and paint so your cabinets will remain beautiful for years to come. 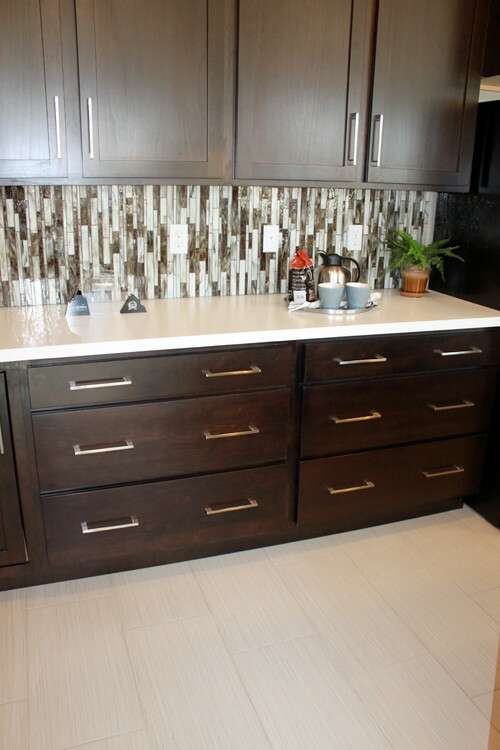 At New Life Kitchen and Bath, our cabinet refacing and custom cabinet work is all done with your comfort in mind. We work quickly, but efficiently, and do our best to avoid disrupting your life. Give us a call at (805) 639-5433, or request a consultation online today.